Orangutan Swing was conceived in the waning light of 2011 to do just one thing. Make space for offline conversations. Ones with real meat. Meaning. Connection. Eye contact. Getting people together who’d otherwise never meet, so a wide array of viewpoints could make chords across a circle. The roundtable style would work for this. We wanted to see more people really talking and listening to one another, because that’s what engages hearts. Too many people skip that step. The conversation-making one, I mean. We jump to “problem-solving” before we hear one another out. At work, at home, with our families, and sometimes with our friends. That’s because ours is a culture that breeds us to be right or wrong, pick 0 or 1. The grays, though—that’s where there’s a real subtle kind of beauty. And without great conversation up front, you get stuff that’s not too thought out. Why? No hearts are involved. So no one really cares. And without care, there can’t be quality. Enter 2012, and the “Year of Dialogue” project. “Dialogue?” I asked my partner, Akira Morita. Since 2006 we’ve been working together full-time at Design Kompany, where we discovered that engaged conversation matters way more than pixels or colors or typefaces. What we’ve discovered from working with more than 300 people in Europe, Asia, and both U.S. coasts is that more than anything, brilliant conversation early in the design process leads to the brightest results. Every time. A new imperative. Other people needed to see this. That dialogue mattered. Much more than dialogue-related textbooks could show (many are wonky, to be honest), we needed to make it obvious just how much dialogue really can bolster any creative thinking process. Especially group ones. Lots of people haven’t experienced a great conversation roundtable. Too many. We needed to bring this work out into the public. In 2012 we used quite a few parks and public squares. The value of what people were getting might not be immediately obvious to them, but like any experience of something artful or tasty, the impression would last a long time. That was the hope. The experiment. Could we make spaces for real dialogue to happen? Could we orchestrate the flow so that it wouldn’t be stilted, argued, or hierarchical, the way we’re often trained for “thoughtful conversations” to be? Could we show people who weren’t part of the Design Kompany client list just how valuable a true dialogue to engage with the heart could be? 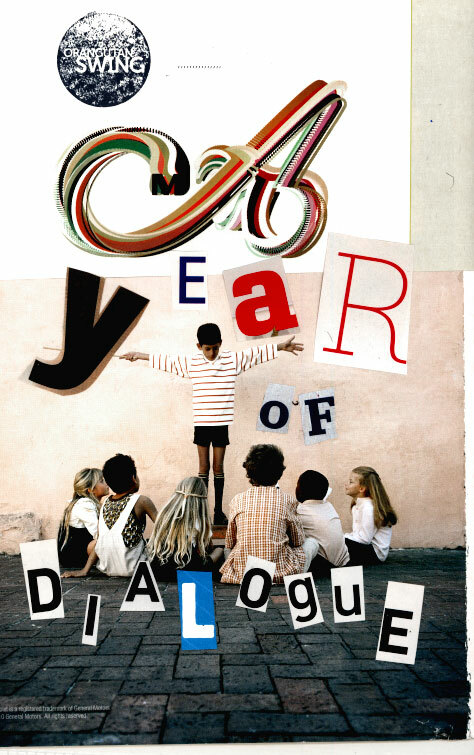 The Year of Dialogue project was designed to simply observe what would happen if we hosted roundtable events around purposefully open-ended themes. Would people convene? What would they say? Could they enjoy the dialogue, even if it meandered? Would people who weren’t used to such an open format participate? What would they gain, if anything? What would we? 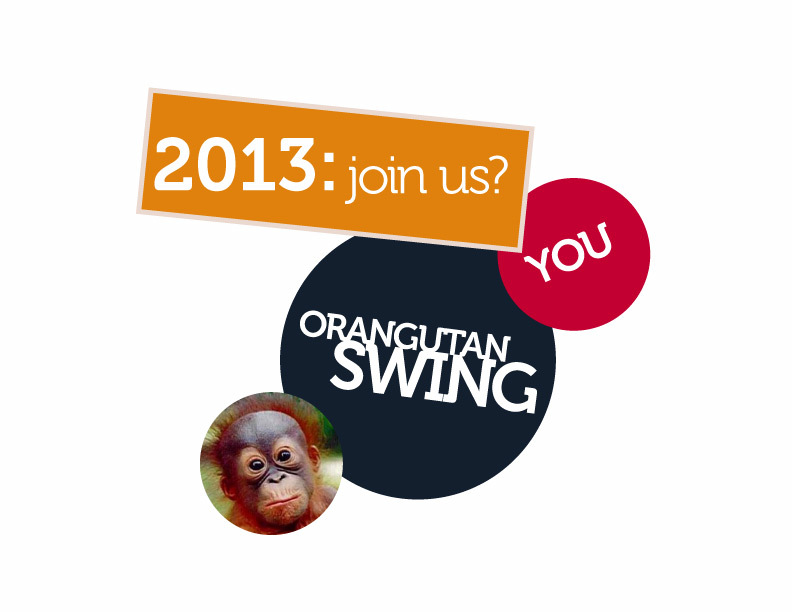 In 2012, Orangutan Swing held 32 roundtable events that drew 1,133 people. This happened on both US coasts, including: Portland, Seattle, New York, Boston, Washington, DC, and Durham, NC. Most events happened in Durham, NC, which is where OS is based. 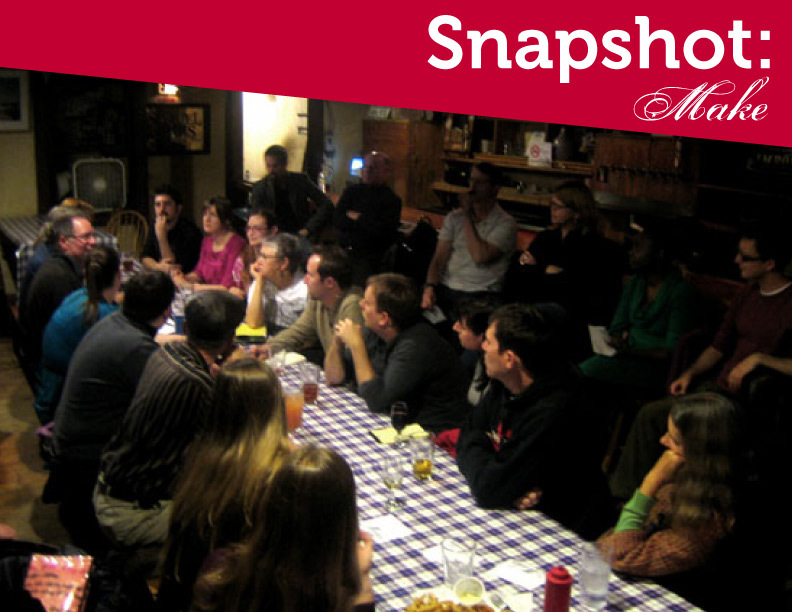 Of 26 venues, events took place mostly in: bars, restaurants, cafes, public parks, and co-working spaces. One of my favorite roundtable series was Aether: Is the Medium Still the Message?, which was based largely on a question posed by Marshall McLuhan (the man who predicted the Internet decades before its time). Akira decided to take it on the road, and so started in New York City with a small collection of people we knew or found. In the image just below, you’ll see who they were. The people came together at Bryant Park, which is just next to the New York Public Library and blocks from Grand Central Station. The heart of Manhattan. Even in America’s busiest city, many people stayed until even after it began to grow dark, a sign that there was true engagement and connection amongst a group that had hitherto never met and was unlikely to reconvene in the same combination again. What held their attention? Conversation. A shared interest. Eye contact. Engagement. That’s what they told us, later, in e-mails and tweets that followed. One person at Aether NY was artist Michael Neff, who’d met Akira and me in Seattle when we were hosting our roundtables there under a different name and style. The LAUNCH series was created to make space to talk about what it’s like being a self-employed creative. Michael remembered that, and joined Orangutan Swing in New York on the strength of knowing what he could expect. Open-ended dialogue. Being people who like to go to art museums, it made sense to observe what a gallery setting might do to shape a conversation. People who arrived at this show began to engage with one another, slowly but later, with more conviction, once they were introduced. Much different from the roundtables, the mingle events tended to stay in the realm of light conversation instead of getting too deep and heavy. That was different, and intriguing to observe. 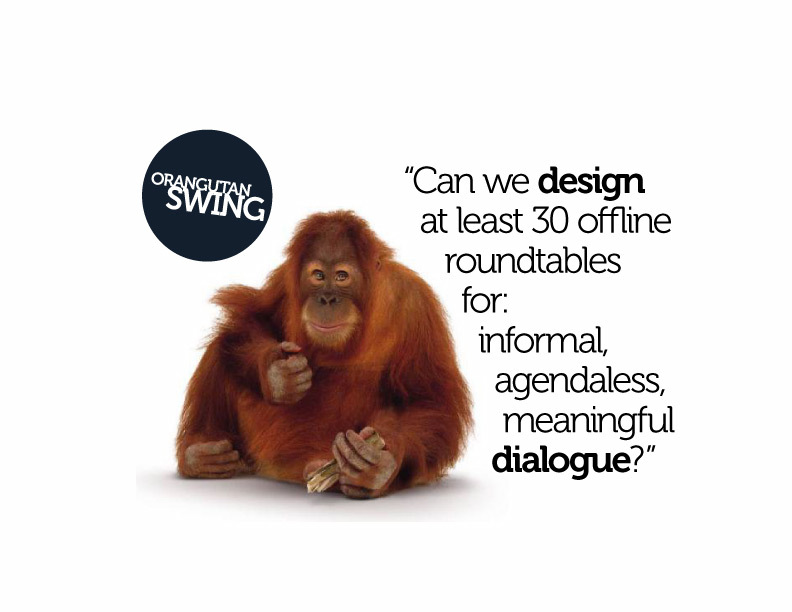 What other kinds of conversation roundtables did Orangutan Swing host? Topics came from out of the blue when the interest held, as though they were things that may have been part of the cultural zeitgeist. Something that was just “on my mind” suddenly became the centroid of a roundtable whose periphery would be dotted with people in that exact industry, looking for more engagement on that exact subject. For example, at “Do we need Internet to make friends?,” Orangutan Swing invited a podcaster, a writer for Match.com, a friend who’d shared stories of the woes of dating at OKCupid, and a behavioral scientist who’s studied chimps. What a discussion! Read the recap here. 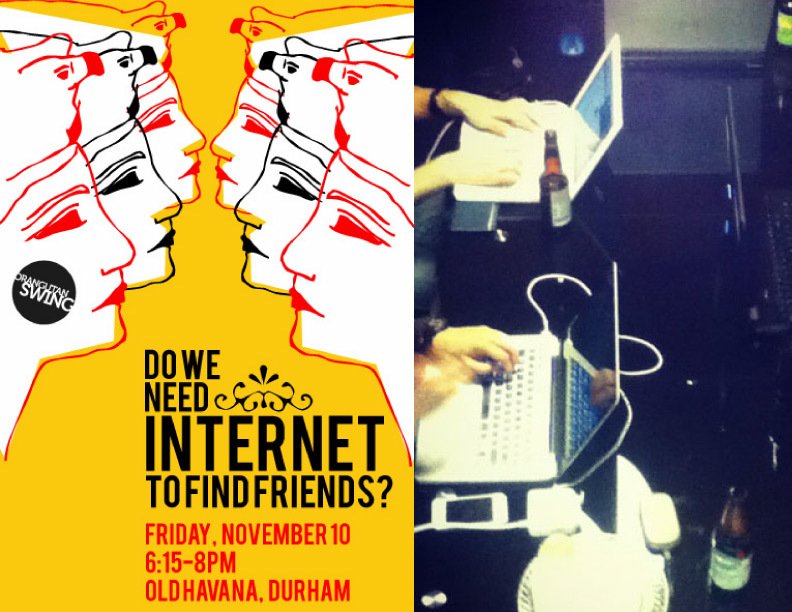 Do we need Internet to make friends? How are we working? Does it work? What could be better? 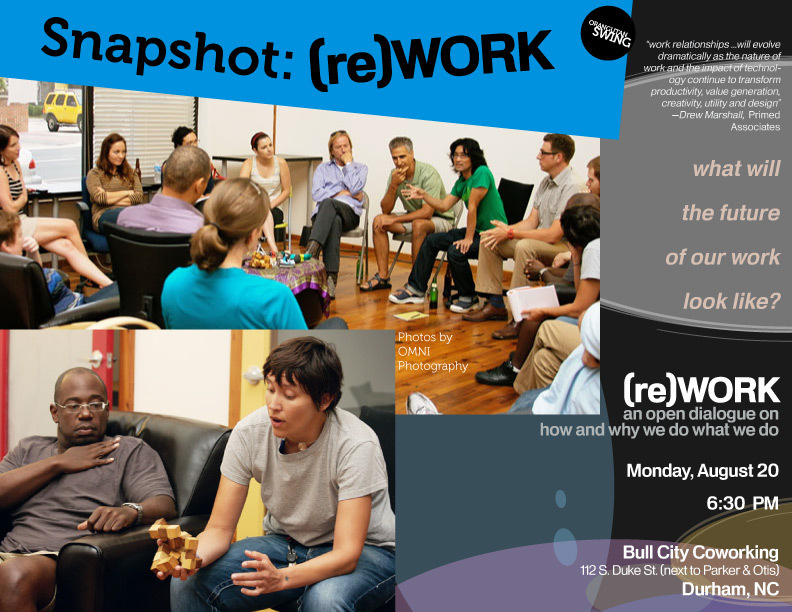 Akira hosted re(WORK) because work culture is one of the things he likes to talk about — a lot — and I thought it was high time he talked about it with people besides me. I’m glad he did! People that we didn’t know as well as a few that we’d met through past Orangutan Swing events showed up to talk about work, culture, and the way we might try things in new ways. 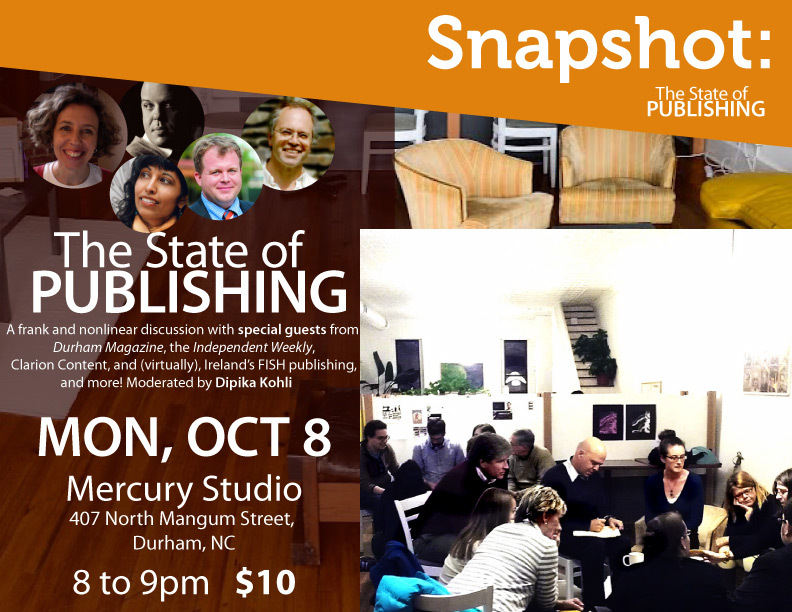 At The State of Publishing, Beth Yerxa of Triangle Art Works posed the question, how much “stuff” do we need to create? Is there too much out there already? Guest Nicholas Michael, who does film work, answered that by saying we as consumers of media trust certain sources to curate for us what they think is worth looking at and reading. It’s about trusting. Being closed is the antithesis of dialogue. Being open makes it easier. What impact did Orangutan Swing events make? It’s probably not a surprise that the most popular events turned out to be those related to how people approach design, because most people who knew “Akira and Dipika” have tagged us already in their minds as “Design Kompany.” People who are living, magically, off of their earnings from projects as artists. “Art and life,” and the appreciation for a creative way of being—both in a modern sense as people who are able to earn a living wage, as well as in the purist sense that art should also express what’s in the human heart. 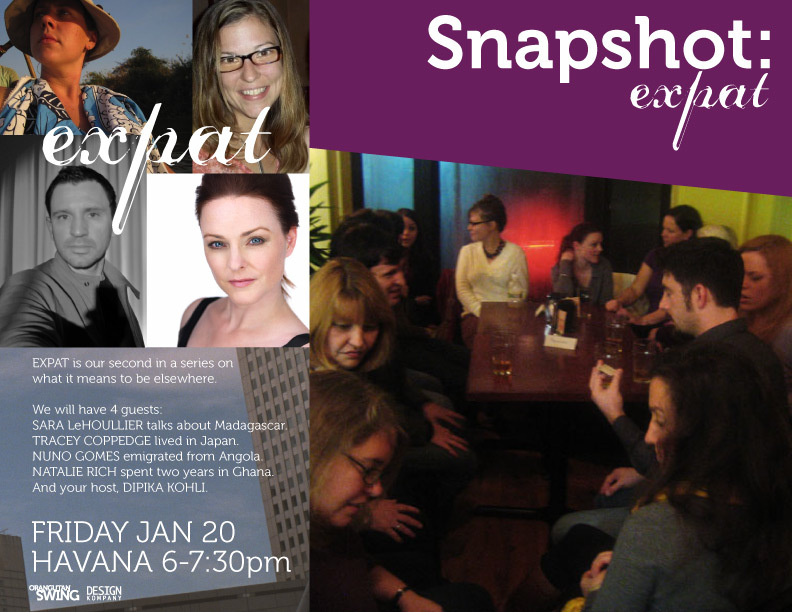 Still, from this event we also noted one guest speaker, Sarah Goetz, finding real connections with other artists and later sharing with us that she’d gotten very inspired and built connections with like-minded people that continued even afterwards. 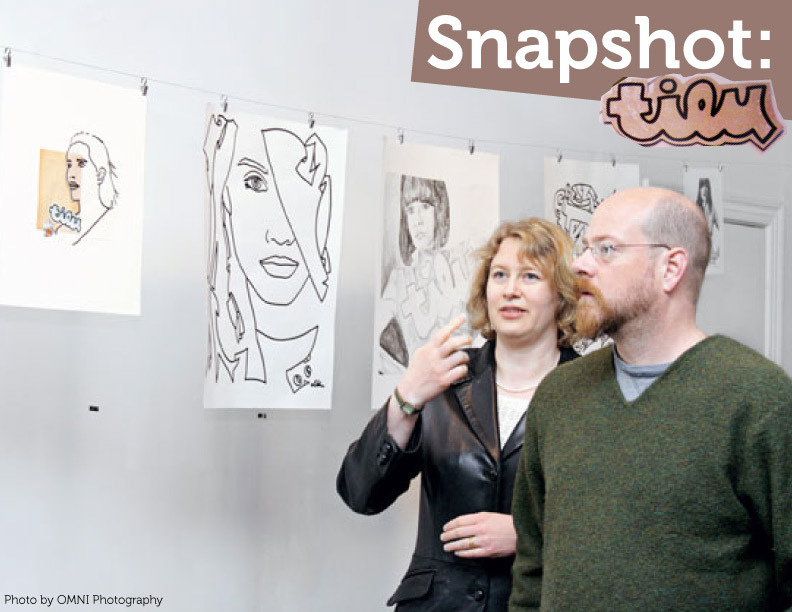 She started showing more of her artwork after that, gaining a mention on the local NPR station’s “The State of Things” show with host Frank Stasio when Laura Ritchie, the co-director of The Carrack Modern Art, mentioned hers as a favorite installation. The Carrack was founded also by John Wendelbo, who’d attended MAKE 2011. When I asked him if he thought there was a market for the creative class to showcase artwork because so many had come to the MAKE roundtable, he nodded enthusiastically. A flat hierarchy and platform for sharing artwork by the people and for the people, The Carrack is a gem. Rick Liebling, the moderator at Aether New York City, wrote an intriguing segue to the conversation by bringing up “sh*tter,” a media product that pokes fun at the throw-away nature of social media. A handwritten thank-you letter arrived from Aether guest speaker Aaron Mandel, who runs the local blog Clarion Content, and whom we met for the first time at the Orangutan Swing event. Aaron has since been sharing news and information about OS events, most recently, STITCH. Connecting and engaging. Gathering people of diverse backgrounds always invites play. Especially when people are primed: they’re coming to the table ready to talk about one particular topic. It doesn’t matter what kind of people are at the same table—we lose the judgment when we arrive. That’s because we’re all on the same plane. A conversation plane. One with a center, and not sides. The Year of Dialogue brought more than 1,000 people that Orangutan Swing had never before encountered to join in an unconventional setting. No real agenda. Open format. A purposefully vague theme so conversation could go in any direction. And, pretty much, no certificate to win or credit hours to gain at the end. Pure conversation, purely for conversation’s sake. Who would come to a thing like this? Turns out a lot of people. Who else would turn up for a crazy event with a title like “Roundtable by Orangutan Swing” but someone who is curious enough to check out the wackiest, weirdest anything? This pre-selected crew became the guests at Orangutan Swing events, adding themselves to the couple of individuals who’d been invited to join and lend their expertise. Sometimes the invited people were the only ones who came (like at “Minority: How does it feel to be overlooked,” or at “Aether NY: Is the Medium Still the Message?”) Even in a huge place like Manhattan, people aren’t always going to turn up because you put up a few signs and send out a few tweets. For people to really be there, in a true way, the conversation topic has to be so incredibly up their alley that they can’t help but show. You have to be open at the start of the conversation, and that includes the people hosting it. Otherwise, there’s too much preconceived, and the word itself means before conception. Being design oriented, getting to the concept is the main agenda in the creative process and that’s where you’ll spend 85% or more of your time if you’re really looking hard for a clear, strong and compelling concept. Commit too soon and you’re going to be somewhere short of the mark. Meaning, short of what the greatest potential of the concept might really be. So, contrary to the popular culture of “getting things done,” the purist design-oriented folks will examine the possibilities and explore deeply before deciding on a concept too early on. As Design Kompany, the team at Orangutan Swing has gotten to know more than seven architecture studios (each of which came up with a wildly different self-concept for their branding). Each group showed us something new. All of them reiterated the message that the only way to arrive at a strong concept is to let things percolate, to arrive slow. The greatest potentiality is there, but you won’t know it right away. An architect Design Kompany got to know through a branding project, and who also helped co-collaborate on the design of the Year of Dialogue is Salone Habibuddin in Seattle. “Design thinking,” she said, was what this was about. Truly harnessing the creative process means thinking clearly about how to approach it. Salone and her team wrote the Wikipedia page on design thinking, so we took what she had to say very seriously. She told us to keep exploring ways to help people find the means and time to play with ideas through conversation. Real conversation. Meaty conversation. The kind that keeps going even after you hang up, log off, or walk home. The Erlenmeyer flask. That’s the metaphor. In order to create an amazing space for people to be able to speak openly, and with real expression without fear of judgment, you MUST have one. A container. OBSERVATION #1: You need a container to create a space. A space in which something can happen. The better the space, the more magic there’ll be. What do I mean by “magic?” Where people let go. Emerge from behind some kind of stock, rigid version of themselves that maybe they feel they have to present when they’re in a group of strangers. Instead of, “What do you do?” the big questions are “What do you think about that?” And always being open to something that they haven’t heard yet. So that something new can bubble up. That doesn’t have to be known ahead of time. In fact, it’s better if it isn’t. OBSERVATION #2: Keep the theme of the conversation relatively open to interpretation. A broader mix of people than we could have imagined came out to an event called AETHER, which we held in New York, Boston, Washington D.C., and Durham. The idea was that keeping the title vague we might invite what I like to call “popcorn” conversation. You know, I had no idea what I was thinking when I proposed the idea, “What if we talked about the aether! Is the medium still the message?” Marshall McLuhan reference aside, people were curious. Puzzled, to be sure, but intrigued. 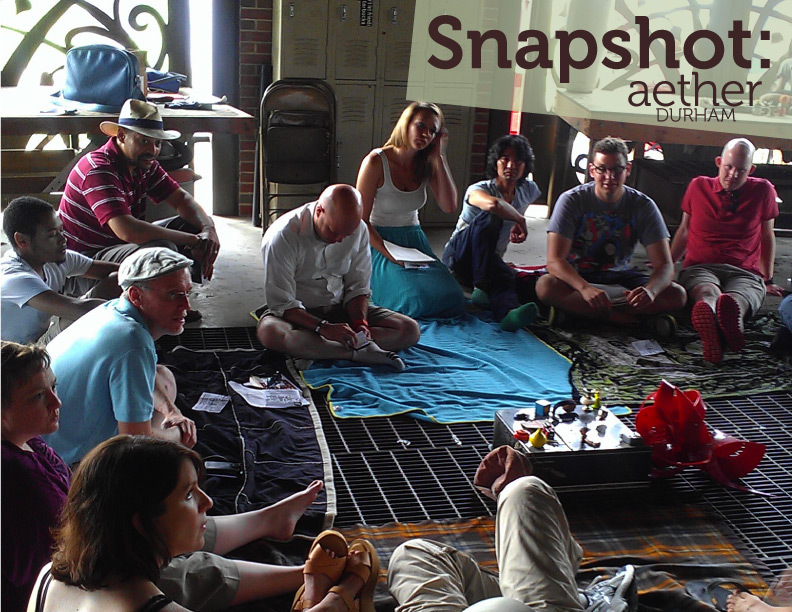 Most of the people we met at the AETHER events were like, “What is this going to do for me?” But then they got there, to come to the circle, and learn from whatever was there to be learned. Open format. OBSERVATION #3: People who are used to agendas and action items tend to be uncomfortable with an agendaless, open format roundtable. Yet after some time, they get more from these than anyone. Those who come, of course, are self-selecting, and just open enough to be curious what it’s about. They’re probably used to showing up in places where they may not be surrounded by people who think in exactly the same ways. That’s fine with them. And being around these kinds of people helps the ones who are usually more comfortable in their cliques start to round a bit at their own corners. It’s fun to watch that happening. It means the container is safe enough to allow this early, important change. After someone does a handstand in yoga class, they have this expression in their eyes, like they just saw something incredible. (A particular teacher at the downtown Durham YMCA was very into the handstands about a year back, and then she’d say, “Now, look at his eyes!”) That’s what we saw when people walked away from the roundtable SCALE, for example. The one about deciding whether or not to grow your business. Most of the people who attended this were not used to this kind of open format conversation, but that’s exactly why it worked. At least three people thanked us profusely afterward, telling us in clear terms that they felt good when they get out of the dialogue, like they got something. Those stars. Stars in their eyes. Happy, because they were part of something bigger. In a lot of senses of the word. OBSERVATION #4: The less used to being part of an open format program people were, the more interested they became as their session progressed. OBSERVATION #5: Circles are comforting. They dissolve any invisible hierarchy, and people begin to relax. When that happens, they say some incredibly interesting things. Would we be able to keep people engaged and interested? Might we find regular folks, who knew the format, and contributed more deeply as months progressed? 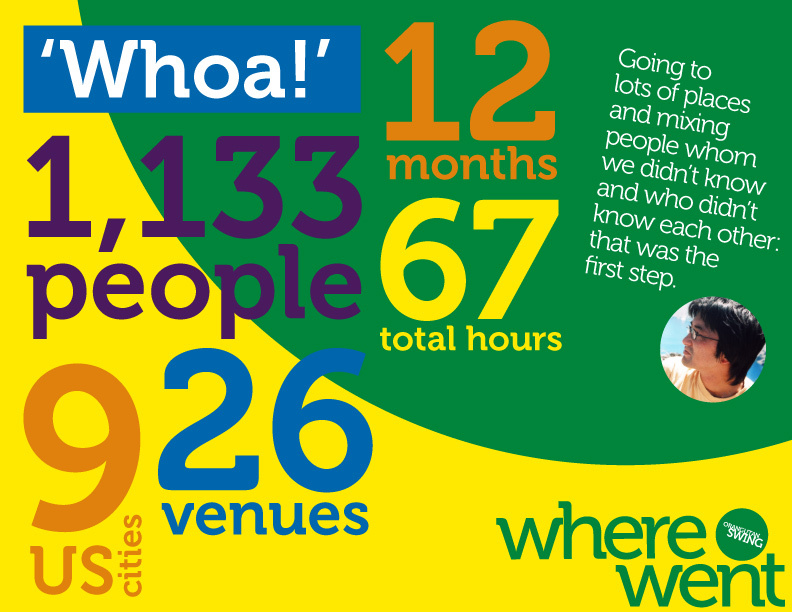 So we held 32 events in 9 cities of the U.S., in an era where people need more than ever to be able to hear and learn from one another in a place that’s not school, not work, and not church. A place where cross-cultural lines cut across cliques, where people come together around a topic instead of a cause, where nothing’s being bought or sold, and there aren’t any ads flashing on the side. No screens. No texts. No status updates. Just face to face, eye-to-eye dialogue. OBSERVATION #6: People really love to know that they’re a part of something that continues, builds history, and gets bigger. 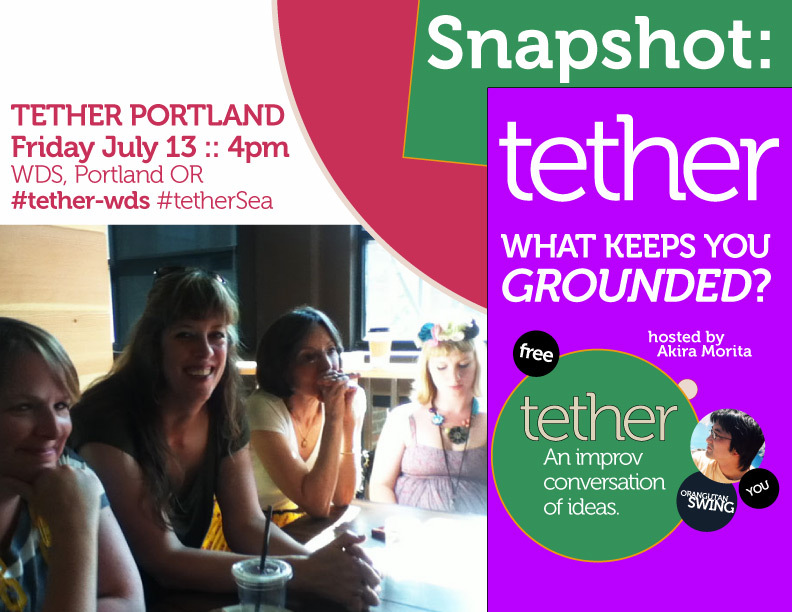 Given an opportunity to participate, would strangers converge to talk about a topic they shared a common interest in? How would people engage with one another in a more or less self-regulated forum? How would we behave offline, as opposed to online, when opinion clashed? What would people walk away with? If there was no agenda, and no outline to follow, where could a conversation go? Would people believe, like we did at DK after eight years of engaging in dialogue with clients, that the importance of conversation ahead of action really matters a lot? There’s still more to learn as we go. This year, we are reading David Bohm’s Dialogue, Edward de Bono’s Six Thinking Hats, as well as William Isaacs’ Dialogue and the Art of Thinking Together. The more we learn about fuzzy logic and quantum physics, the more clear it becomes that people aren’t able to say anything with certainty so we may as well drop that pretense. And listen. Listen to one another with real engagement and attention. As though our very life depended on it. Because if we measure the quality of our life in terms of what we learn and the memories we make, it does. Conversation can soothe the world. Great conversation can tame it. 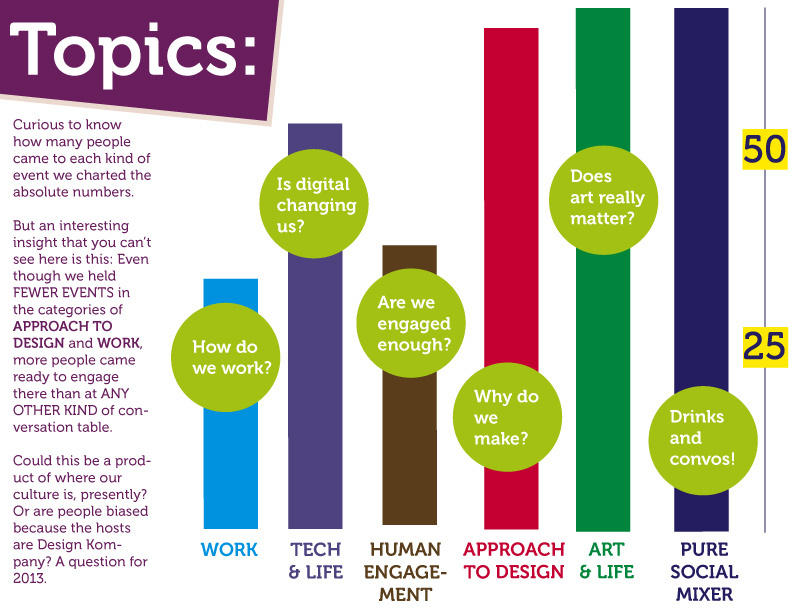 What shall we talk about together in 2013? Thanks for the shoutout! Looking forward to participating in future events — you’ve created opportunities for some great conversations.